How to Throw an Award-Winning Oscars Party! It’s almost time for the biggest movie awards night of the year: the Academy Awards, AKA the Oscars! You love watching the red carpet arrivals (those dresses! ), you love guessing who will win each award, and you love doing it all with friends and family. Why not throw an official Oscars party, then? We’ve got a lineup of great ideas to help make your party worthy of a standing ovation! A central component of every good party is GOOD FOOD! Cakes are great at pulling double duty, serving as edible centerpieces to your spread. Make your cake the star of the show with a few simple star toppers cut from glitter paper! And what could be a better treat for a night celebrating the best films of the year than popcorn? 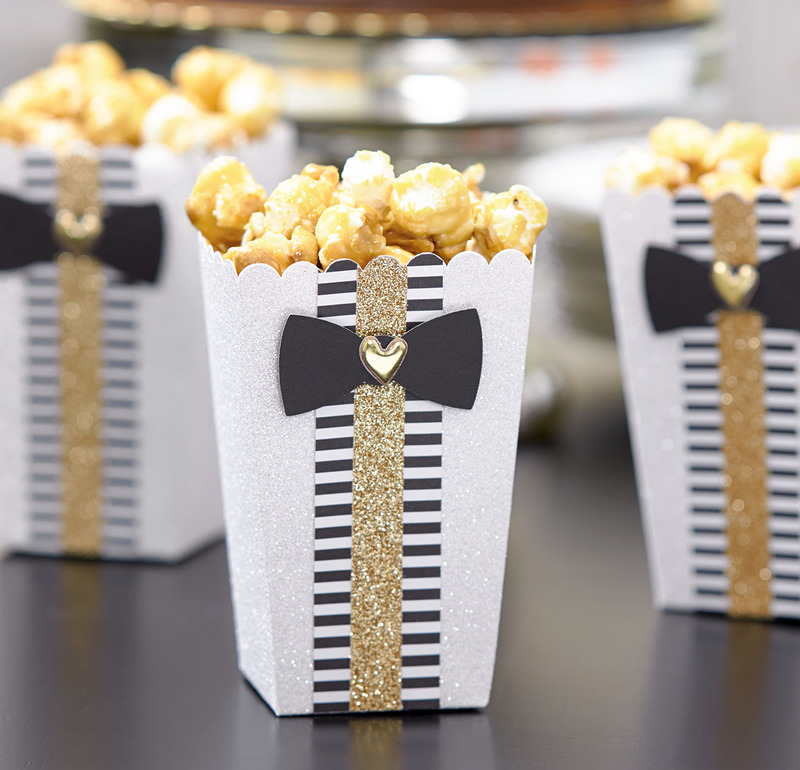 Little popcorn boxes make it much easier for everyone to munch throughout the night without passing around a bowl, and they make your guests feel like they’re at a movie theater. 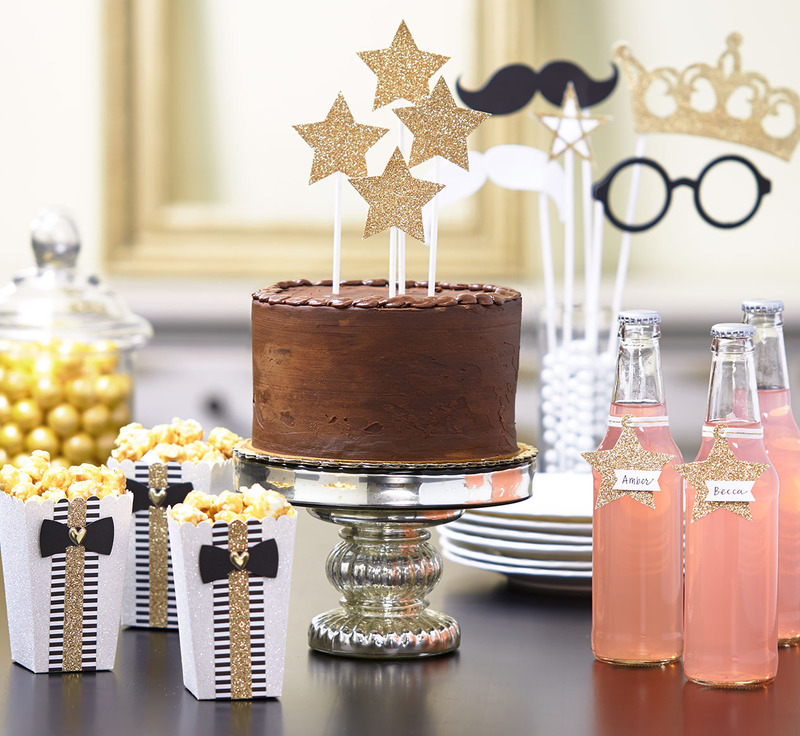 Dressing up your boxes so they look like tuxedos is an easy way to give your party a definite Oscars flair, and our Cricut® collections make them so easy to throw together. 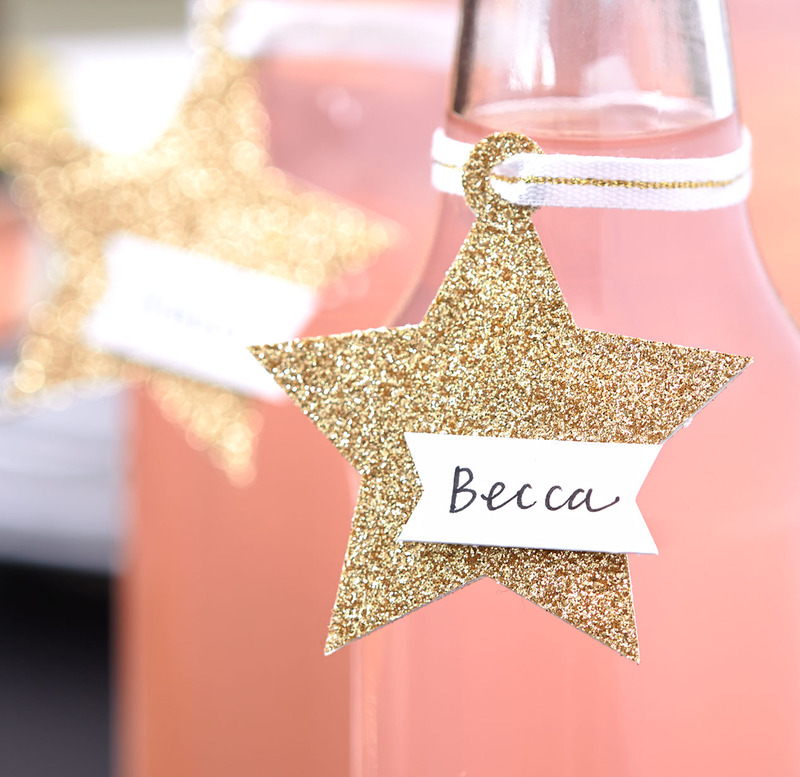 Rather than going the plastic cup and permanent marker route to keep track of everyone’s drinks, add some sparkle to your sodas and create these personalized name tags! These stars are super simple to make, but they’re just the kind of detail that will make your guests feel like VIPs. Okay, now on to activities. We love these free printable Oscars bingo cards from The House That Lars Built. Come up with a fun prize to give the person who gets bingo first. Also, since the celebrities get their photos taken all night long, we think another way to have fun with your guests is by having a photo shoot of your own! You may have spotted those adorable prop sticks in a vase, playing the role of a simple décor piece in that first photo, but they are also great way to make everyone less camera shy, AND they can be sent home with your guests as souvenirs from your fun night. You can even create your own Polaroid-style frame. This activity is sure to get everyone laughing, and by the end of the night, you’ll have tons of great photos to share! The first 15 people to correctly guess the winner of ONE of the categories will receive the beautiful Everyday Life™ album. The first 10 people to correctly guess the winner of TWO categories will receive the Everyday Life album, the My Crush® Everyday Life pages, and the Everyday Life washi tape. The first 5 people to correctly guess the winner of all THREE categories will get the Everyday Life prize package, including the album, the My Crush Everyday Life pages, the Everyday Life washi tape, both the 4″ x 3″ and the 4″ x 6″ Memory Protectors™, and the Picture My Life™ Live Your Day cards—which are no longer available for purchase! Start making your decorations, and submit your guesses here on the blog! It’s sure to be a night to remember! I will vote for The Revenant for best picture. I will go with Leonardo Diario for best actor. And lastly I would vote for Charlotte Ramping for best actress. I’ve got my fingers crossed! Such great ideas! These ideas are easily transferrable to any number if fun occasions! The Revenant, Leonardo DiCaprio, and Saoirse Ronan. Love those glitter stars! This would work great for a graduation party too! That’s a great idea, Margie! I will vote for The Revenant for best picture. I will go with Leonardo Dicaprio for best actor, and Brie Larsen for Room. crossing all my fingers!! Wow, I can’t believe only one person got all three right! Your giveaway made Oscar night even more fun. Thanks!